If you’re not directly involved in schools or innovation, you can still help shape education innovation. 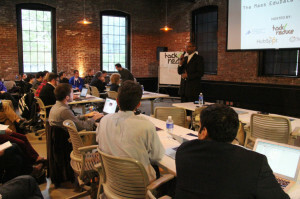 60 civic hackers, developers, and students are working on the Mass EduData Challenge in Boston. Parham, Government Innovation Officer for the Commonwealth of Massachusetts, shared school data with those he believes are most suited to analyze it — hackers. “We can leverage the insights and skill sets of the folks in our extended community who are, first of all, very passionate about civic innovation and, second of all, they have specific skill sets, whether it be in application development, user experience design, data analysis, or visualization,” Parham said.